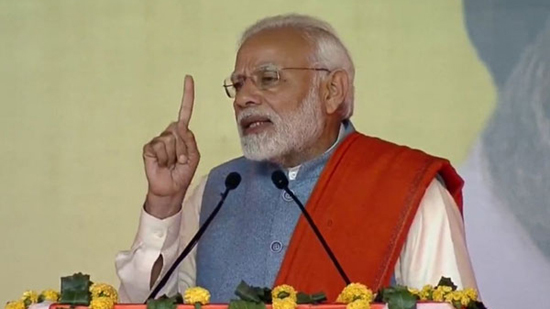 Prime Minister Narendra Modi on Sunday attacked the BSP-SP alliance, saying that they have no vision for the country, but were only interested in selling and transferring of votes of the poor, for their own vested interest. “Have you ever seen an elephant riding a bicycle? But now, it is going on and they are targeting the Chowkidar. Mayawati and Akhilesh and even Congress have been abusing me, but abuses have been hurdled at me for over two decades now. I am ‘Gaali-proof’ (abuse-proof) now,” he said. Addressing an election meeting here, Mr Modi appealed to the people to beware of the conspiracy of the two political parties- SP and BSP. “They are contesting just 40 seats each, which cannot make them any force to form the government at the Centre. Their only interest is to sell the votes to each other, without even saying what they will do for the country,” he added. “Mayawati has joined hands with the people, who once used to threaten to give her the same treatment, what Saddam Hussain got in his last days. Same goes with Akhilesh, he has stooped to such a level that he forgot that it was Mayawati, who suggested treatment at a Mental centre for Mulayam Singh,” the PM said about the past relationship between the two political parties of this politically-sensitive state. He further said that now Rs 75,000 is being given to the marginal and small farmers, who have five acres of land or less, but when he comes to power again, then such restriction would be removed. He claimed that 12 crore farmers are getting the money. Talking about the country’s attack on terrorism, the Prime Minister said, ‘The foreign policies of the NDA government helped India to get new allies, the whole world stood with us, when we decided to launch the surgical strikes on Terrorism. “Only the voice of the powerful is listened in this world. No one listens to the ones, who cry. The pledge that we have taken to create a new India, will be strong and effective as well,” he said. “What used to happen earlier? Terrorists used to come from Pakistan, attack us and Congress government used to cry before the world that we’ve been attacked. But, this is new India. ‘When terrorists attacked Uri, brave soldiers of the country conducted surgical strike there,” he said, while adding that when they committed the second mistake in Pulwama, ‘we entered their home and conducted airstrike’.